For much of his eight-hour shift, Tracey Foley stands in a small rectangle of space, braving the elements: The cold and wind and sometimes snow. He greets the strangers who pass him. He smiles and offers Christmas blessings. Some respond. Many don’t. Several stop to drop pocket change into his red kettle. A few others promise a donation later. Tracey Foley is one of the 20 to 25 paid Salvation Army bell ringers in Ann Arbor. Foley, a veteran and a youthful-looking 50, rings the bell in his right hand. When he grows tired, he switches to his left. From mid-morning to 8 p.m., after whatever warmth that comes from the sun is gone, he rings the bell. He never complains. For Foley, it’s a dream job. “I get more joy doing this than any job I’ve ever had. There’s no greater job than to serve the people. I wish it was year-round,” he said. 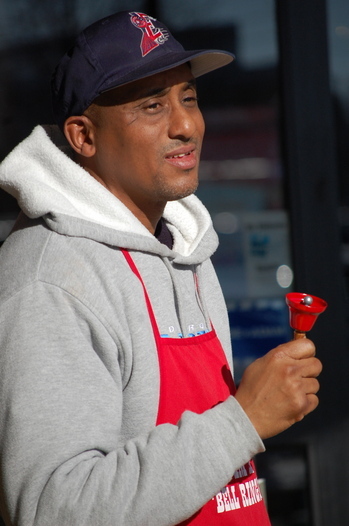 Foley is one of the Ann Arbor Salvation Army’s 20 to 25 paid bell ringers, a corps of men and women who hit the malls, shopping centers and grocery stores for the weeks between Thanksgiving and Christmas, ringing the telltale bell that signals their presence, standing next to the familiar red kettle. While most of the Salvation Army’s red kettle drive bell ringers are volunteers -service organizations such as the Kiwanis take an entire day to ring the bells - a group of paid bell ringers gather Monday through Saturday in a large room of the Ann Arbor Corps Community Center on Arbana Drive. There are no bell ringers on Sundays, a day reserved for worship. The paid bell ringers arrive at the community center to mingle and relax, say a prayer and then head for eight-hour shifts that earn them $7.45 an hour, minimum wage. They begin a week or two before volunteer bell ringers take their posts, and fill in the gaps after that, said Susan Carey, kettle coordinator. There are 30 red kettle locations in Ann Arbor, down from past years because some stores, such as Borders, have closed. But they’ve added new sites, Carey said, such as the Salvation Army Thrift Shop on South State Street. For most of the paid bell ringers, it’s their only job. Many are homeless, Carey said, living at the Robert J. Delonis Center or the Veteran’s Haven of Hope House on Henry Street, run by the Salvation Army. Their ages range from 20 to 70 years old. There’s some friendly competition among the bell ringers, with their daily tally posted on a wall in the community center. Many average $100-$200 a day, but one ringer is king. He regularly brings in $400 to $500 a day, Carey said. For Foley, who is otherwise unemployed, homeless and living at the Hope House, it’s the perfect job. He wears a snowmobile suit under his sweatshirt and pants and said he is rarely cold. “I try and be personable to people, but I don’t have to do a sales pitch. Everyone knows about the Salvation Army,” Foley said. The Salvation Army has been there for Foley. They helped his family after a house fire destroyed everything. And they’ve given him shelter after he ran out of friends and family who could help. Foley hasn’t had a permanent job since Exemplar closed in Ypsilanti a decade ago. Bell ringing is a chance to give back, Foley said, and earn some money. He doesn’t worry about how much he brings back. “Whatever I have when I come back, it’s more than I had when I started,” he said. While the bell ringers brave the elements, there are limits, said Maj. Dianna Williams, from the Ann Arbor corps. Bell ringers don’t go out in all-day rains. “We don’t want them to get sick, that’s not our goal,” she said. “And people don’t give when it’s raining. They just go by fast.” There have been two days of solid rain since bell ringers took to their stations shortly before Thanksgiving where no one was sent out. It’s part of the reason the red kettle drive is $4,500 behind schedule, Williams said. Sun, Dec 11, 2011 : 9:17 p.m.
Sun, Dec 11, 2011 : 6:43 p.m.
Yeah Ann Arbor.com Instead of posting about the Salvation Army bell ringers, why don't you do an article focusing on the people that scream as they walk by that they already gave, or how rude they are by ignoring even a simple hello. I'm sure many on this blog can relate seeing as they're currently acting as if they never had a hard day in their life. Sat, Dec 10, 2011 : 6:59 p.m.
Did you ever notice that the Ann Arbor Salvation Army thriftshop has ridiculously higher prices than just about any other thrift shop in the state? Sat, Dec 10, 2011 : 5:37 p.m.
Only in Ann Arbor would the spirit of giving be questioned because of a belief...the LBGT community is not going to be devastated by the SA religious stance...but those that the SA help will be if donations are down...and I dare say some of those helped may be part of the LGBT community...giving is giving....and by the way, don't donate to the Catholic Church Social Services, Presbyterian, Baptist, or Espiscopal Church, Chamber of Commerce or anything else that doesn't fit your beliefs of generosity cuz there is a point to be made! Let the cold, homeless, hungry fend for themselves...that's the spirit! Sat, Dec 10, 2011 : 7:02 p.m.
@MichiganMan: The Salvation Army is not an Ann Arbor-based organization. They are a national organization headquartered in Alexandria, Virginia - a few minutes down 395 from the Hill. Coincidence? The Washtenaw County Shelter Association, Ozone House, SafeHouse, Peace Neighborhood Center, SOS, and Food Gatherers (yes, I see that AnnArbor.com posted an article about them today) are all Ann Arbor-based organizations. Give to them. Sat, Dec 10, 2011 : 6:26 p.m.
Michigan Man, how about another long standing Michigan charity, like the United Way? They have been serving this community for decades and don't have a bigoted agenda. They would be a great option for charitable giving that benefits the homeless! Sat, Dec 10, 2011 : 6:14 p.m.
djm - It is quite apparent that the LGBT (whoever that is) community enjoys attacking long standing, civic oriented and charitable Ann Arbor based, socially responsible organizations, often led by find and devoted Ann Arbor community leaders. I am not sure how attacking the fabric of Ann Arbor benevolence makes them feel better - it only serves to further alienate this minority from those who are interested in serving others - I, as countless others have for years, will just give more to the Salvation Army to compensate for a small percentage of Ann Arborites who just can't seem to reconcile simple matters in their minds. Sat, Dec 10, 2011 : 5:45 p.m. There are many charities that don't have political affiliations or hidden agendas. This is not a zero sum game. Your argument is a false dilemma. Sat, Dec 10, 2011 : 4:56 p.m. Enough about the Salvation Army already. Let's hear about some charities that don't have bigoted policies for a change! Sat, Dec 10, 2011 : 4:17 p.m. I challenge all the comments made by each individual....with the exception of #1....Have YOU ever been homesless, hungry, in need of clothing, a place to go out of the elements and see a friendly, smiling, caring face? I doubt it! Sat, Dec 10, 2011 : 5:13 p.m. There are far better charities out there. Sat, Dec 10, 2011 : 4:53 p.m. Sat, Dec 10, 2011 : 3:40 p.m.
Again, no thanks. I avoid businesses that allow this cacophony. Sat, Dec 10, 2011 : 5:12 p.m. Welcome me back to what, exactly? Are you hinting that you don't accept some people's money and I'm somehow special? I'm also perplexed why this business warrants all this special attention from this blog. I'm expecting a special report tomorrow on how many bell-ringers fight through the carpal-tunnel pain just to ding-dong all month long. Sat, Dec 10, 2011 : 4:38 p.m. Macabre = Salvation Army will be just fine without you! You can go in your own direction = that is totally fine with the millions who are honored and loyally support the Salvation Army - when you change your mind - the really neat thing about the Salvation Army is we do not hold it against you forever - we will welcome you back without embarrasing you. Sat, Dec 10, 2011 : 3:07 p.m.
Sun, Dec 11, 2011 : 6:40 p.m. I see no sources in that BLOG post, merely stating opinion. The Salvation Army is a religious group, they are entitled to have their beliefs but no where on its website does it state &quot;If you are part of the LGBT community don't even bother asking for help, we won't give it to you, God said so&quot; Show me where that statistic was found. Sat, Dec 10, 2011 : 1:14 p.m.
AnnArbor.com, this is at the least the third story you've run on the red kettle campaign. There are other nonprofits out there doing the same work AND who don't discriminate in their services and hiring practices. Why don't you cover some of their holiday giving campaigns? Sat, Dec 10, 2011 : 12:15 p.m. Thanks for the great story! I will definitely dig deeper as I pass by the next Red Kettles! Happy Holidays.